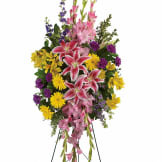 This stunning spray is a beautiful and touching display of your sympathy and devotion. The bright yellows and peaceful pinks in this standing spray will bring bright memories to mind. 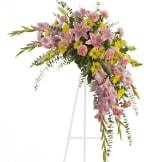 • A lovely composition of flowers such as green roses, gladioli and button spray chrysanthemums, pink spray roses and carnations, light pink oriental lilies and snapdragons are arranged with a mix of beautiful greenery in a standing spray of flowers that's delivered on an easel. 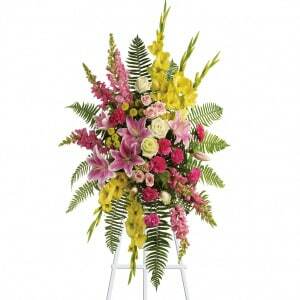 A very pretty arrangement that brings a little light and happiness to the room. Very nicely done. A very beautiful arrangement. Looked exactly like the photo. I was very satisfied and found the web site to be very easy to make my order. En recuerdo con muchísimo cariño y amor de su primo:Luis Alexis Suarez Montenegro, padres, hermanos e hijos. Lamentamos profundamente su partida y que Dios todo poderoso y misericordioso la reciba en sus brazos y le de el descanso y paz eterna.